Here, Bullet by Brian Turner, who served in the U.S. army for seven years after receiving his MFA and was a team leader for one year in Iraq with the 3rd Stryker Brigade Combat Team, won the 2005 Beatrice Hawley Award and was printed by Alice James Books — a nonprofit cooperative poetry press. (The title poem, “Here, Bullet,” was recently profiled in the Virtual Poetry Circle.) The collection is broken down into four sections, and each section is preceded by a quote relevant to it, with some even quoting the Qur’an. Turner is adept at illustrating the violence of war, but also the humanity that accompanies it. From the startling nature of rockets going off over head to the silence of bullets as they enter the body, he provides a keen eye into how those instruments of war impact both sides of the battle equally psychologically, physically, and spiritually. Soldiers who craft wartime poetry have generally either fallen into the category of using graphic violence to shock and awe the reader or using quieter imagery to bring about reader understanding about psychological impacts of battle. There also are those that have political poems that are heavy on criticism or propaganda, but those would fall less into the wartime poetry category. Turner combines both violence and peace in his imagery, but in a unique way that has violence silently creeping into the lines and shocking readers. For instance, in “Eulogy” (page 20), readers may hardly notice the suicide of Private Miller because he takes “brass and fire into his mouth,” but once the birds fly up off the water by the sound, it is clear the brass and fire are from a gun. While outright, violent images can be eye-opening for readers, the quiet power in some of Turner’s lines are that much more lasting. From “Katyusha Rockets” (page 32), “Rockets often fall/in the night sky of the skull, down long avenues/of the brain’s myelin sheathing, over synapses/and the rough structures of thought, they fall/into the hippocampus, into the seat of memory–/where lovers and strangers and old friends/entertain themselves, unaware of the dangers/headed their way, or that I will need to search/among them.” These poems not only pay tribute to soldiers on all sides, but the civilians, the heroes, and a soldier’s fears and his regrets. Some poems are infused with deep sadness, while others are steeped in great pride. Brian Turner is a soldier-poet who is the author of two poetry collections, Phantom Noise (2010) and Here, Bullet (2005) which won the 2005 Beatrice Hawley Award, the New York Times “Editor’s Choice” selection, the 2006 Pen Center USA “Best in the West” award, and the 2007 Poets Prize, among others. Turner served seven years in the US Army, to include one year as an infantry team leader in Iraq with the 3rd Stryker Brigade Combat Team, 2nd Infantry Division. Prior to that, he was deployed to Bosnia-Herzegovina in 1999-2000 with the 10th Mountain Division. Turner’s poetry has been published in Poetry Daily, The Georgia Review, and other journals, and in the Voices in Wartime Anthology published in conjunction with the feature-length documentary film of the same name. This is my 48th book for the 2011 New Authors Reading Challenge. This is my 22nd book for the Fearless Poetry Exploration Reading Challenge. Welcome to the 111th Virtual Poetry Circle! Also, sign up for the 2011 Fearless Poetry Reading Challenge because its simple; you only need to read 1 book of poetry. 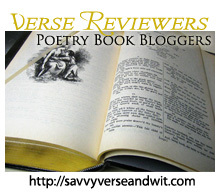 Please contribute to the growing list of 2011 Indie Lit Award Poetry Suggestions, visit the stops on the National Poetry Month Blog Tour from April. I’ve you missed the other Virtual Poetry Circles. It’s never too late to join the discussion.